Part of our bible study program at church is a program we call “CAB”. It stands for Cuppa And Bible, and we encourage people to spend time each day with their Bible over a cuppa. Then we come together on Sunday afternoon and talk about the scriptures we have read. This past week we have been reading Matthew 1-11. There are a lot of really interesting things in Matthew, especially if you know how to look for things like textual apparatus and structures. Each of the Gospel writers all talk about the same historical events, but each one has a different slant on them based on what they were trying to say to their readers. Matthew, in writing to a Jewish audience, has certain things that are unique to His Gospel because of his unique slant on the story. One of the things which was shown to me many years ago by one of my lecturers in Bible College was about the first verses in Matthew – the genealogy of Jesus. At the end of this genealogy Matthew says that there were 14 generations from Abraham to David, 14 from David to the Exile, and 14 from the Exile to Jesus. Why 14? The letters in the Hebrew alphabet are also numbers, so the first letter is 1, the second letter is 2, etc. The letter which is the equivalent of our D is the number 4, and the equivalent of our V (which was actually a W, but that’s a whole other story) is the number 6. There are only consonants in the ancient Hebrew (vowels were added later), so the name David – literally DVD, is numerically 4+6+4, or 14. Remember that Matthew was a tax collector – he was good with numbers. We would expect that his math was pretty good. I want you to count the names in the list. Each name will appear twice, but obviously you only count it once. Now lets do some maths. 14 + 14 + 14 = 42. There should be 42 names. Name number 14 is David, and number 28 is Jeconiah. All good so far, Matthew’s maths is good so far. But then there are only 13 left. Did Matthew get it wrong? Did he make a mistake and miss out a name? Or is there something more going on here? 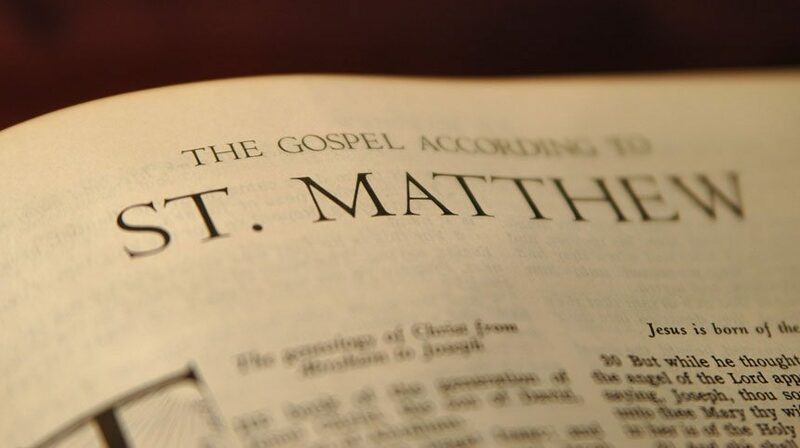 There are a whole lot of other textual things going on in Matthew – groupings of ideas and passages, inclusios, chiasms, repetition of phrases and ideas, but from the beginning of the story right through until the end, there is something else going on. The story of Jesus doesn’t start with Jesus. For Matthew, it begins when God calls Abraham way back in Genesis, and it doesn’t end with Jesus either. It continues in the church, the ongoing lives of the disciples and the disciples of the disciples and the disciples of the disciples of the disciples… in other words, the story of Jesus continues with us. We are the 14th generation of the genealogy of Jesus – you are the light of the world and the life of Jesus – the resurrected life – is lived out in you. Now, maybe its just me, but that’s pretty exciting. That Jesus would live in us, and we live in Him. That the life and work of Jesus continues “until the end of the age” in and through us. What a privilege. What an honour. Next Post LinkWhat Moves You?